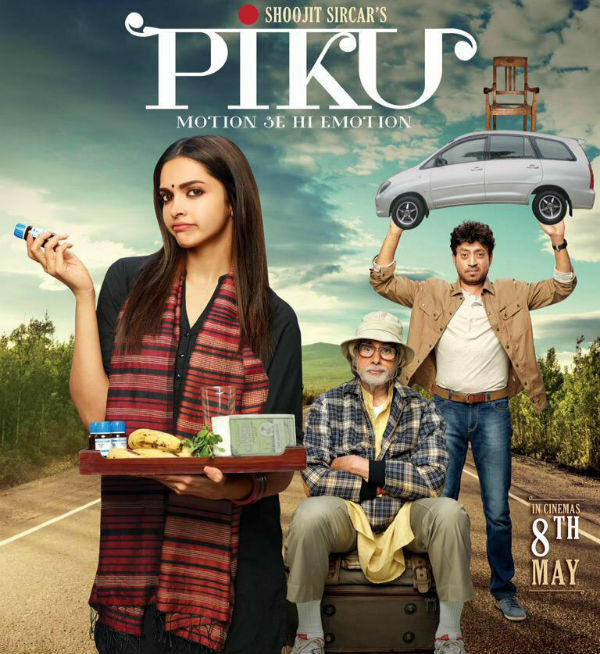 Piku has been seen. Yes! And it has never been such a personal experience for me ever, in a theatre, by a film. The synopsis may point out that it is father-daughter chemistry; and though it is, still, it’s more than that. More chemical reactions than you can imagine! And all, exothermic, dissipative! Being from a bong family, this post might sound biased, but the film is not. From the first frame onwards, it starts with the dynamics between the father and daughter brilliantly portrayed by Mr. Bachchan and Deepika Padukone. The suave yet traditional lifestyle of the contemporary Bengali films has been appropriately painted on the screen. Ekdom tule dhore che(absolute depiction of it),my mom says. And yes, not to forget the biggest obsession and subject of fascination of a bong, The Digestive System. Motions are the drive force of a typical Bengali. From the time we are born, we are surrounded by such kakus, dadus etc. who are in some or the other way suffering from a digestive ailment and its related paranoia. As kids, we imbibe that into us somehow. But, in this film, the constipation is not just constipation. It’s more than that. ‘Motion se emotion’. Who loves to die with a constipated feeling in his heart? Everyone just wants it thrown out. Because it is what gives relief. Though at times, it can be painful, or joyful, everyone wants to vent it out. Bhaskor was so much relatable to my own grandpa. And maybe, too many such grandpas around there. His constant fears about his motions, his health problems, his pre-journey motion problems, his attitude towards others, to his daughter, that constant khit khit, birokto (rebukes,irritation) and so on, each and everything was so personal to me. Even his death. The Happy Death. Even that putting on a ventilator dialogue was so apt. Bengalis surely to this date, have that thought in their head. At this right moment, if you ask ten Bengali dadus, seven will say its inapproporiate to put a dying man on ventilator. Juhi Chaturvedi is a genius. Piku, is psychologically what her dad Bhaskor is, physiologically. Constipated. With her emotions. About her life. She is trapped, and that comes out in her behaviour towards others. Until, she gets to know about the laxative, Rana, played so fantastically by Irrfan Khan. Infact, at one point of time, he himself is questioning himself. He himself feels trapped between the daughter-father duo. The direction by Shoojit Sircar is as modern as you see it around yourself. The families, the homes, their lifestyle it is as consistent as it had been in Vicky Donor, resembling the contemporary India around us. Best thing was how he inserted the song ‘Paagla khaabi ki jhaanjhei more jaabi’ from Open Tee Bioscope, which is one of his productions, in a background radio music being played in one scene. The Bengali platter with fish fries, begun bhaaja, chicken, pulao along with the full-on chit chat the relatives get into, all reminds you of a typical Bengali lunch. Apart from all that, the music by Anupam Roy is fresh. The frames by Kamaljeet Negi are beautiful. The editing by Chandrasekhar Prajapati is crisp. And again, Juhi Chaturvedi, for sure, needs a standing ovation for that beautiful screenplay and the dialogues. That’s it, folks! Go and watch it.